"Deborah Jane Hutchins, Westbrook College, Class of 1976"
Westbrook College student Deborah Jane Hutchins, Class of 1976, was a Medical Assisting major and lived in Linnell Hall. 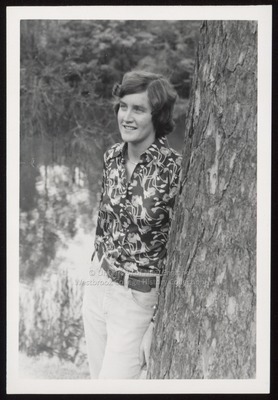 For her senior class candid photo, which appeared in the 1976 Tower Yearbook, she wore light colored jeans with a wide leather belt sitting on her hips and a long-sleeve, dark, floral blouse. Her hair was short, just covering her ears, and parted on the side. Deborah leans against a tree trunk with a pond, very probably the duck pond at Evergreen Cemetery, behind her.